Definition at line 41 of file llfloatervoicewizard.h. Definition at line 49 of file llfloatervoicewizard.cpp. 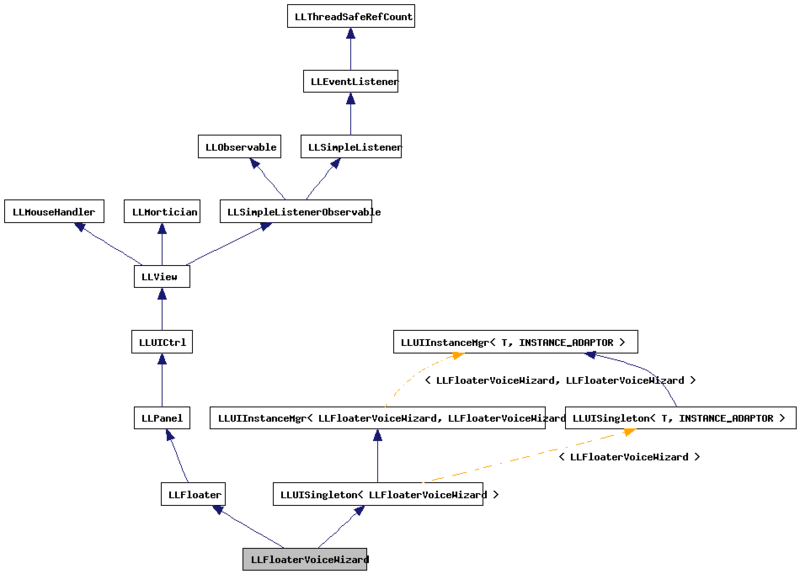 References LLUICtrlFactory::buildFloater(), LLFloater::center(), createPanelDeviceSettings(), FALSE, gUICtrlFactory, LLPanel::mFactoryMap, and mLogic. 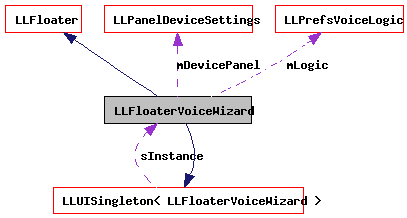 Definition at line 60 of file llfloatervoicewizard.cpp. Definition at line 208 of file llfloatervoicewizard.cpp. Definition at line 78 of file llfloatervoicewizard.cpp. References LLPanel::childSetEnabled(), LLPanel::childSetValue(), LLPanel::childSetVisible(), LLFloater::draw(), FALSE, LLControlGroup::getBOOL(), LLUICtrlFactory::getButtonByName(), LLTabContainerCommon::getCurrentPanelIndex(), LLUICtrlFactory::getTabContainerByName(), LLTabContainerCommon::getTabCount(), gSavedSettings, gUICtrlFactory, mDevicePanel, mLogic, LLPanelDeviceSettings::refresh(), LLPrefsVoiceLogic::refresh(), LLPanel::setDefaultBtn(), and TRUE. Definition at line 165 of file llfloatervoicewizard.cpp. Definition at line 189 of file llfloatervoicewizard.cpp. Definition at line 155 of file llfloatervoicewizard.cpp. Definition at line 175 of file llfloatervoicewizard.cpp. Definition at line 143 of file llfloatervoicewizard.cpp. References mDevicePanel, LLFloater::onClose(), and LLPanelDeviceSettings::onClose(). Definition at line 202 of file llfloatervoicewizard.cpp. References LLSD::asInteger(), LLUICtrl::getValue(), gSavedSettings, and LLControlGroup::setBOOL(). Definition at line 133 of file llfloatervoicewizard.cpp. Definition at line 66 of file llfloatervoicewizard.cpp. References LLPanel::childSetAction(), LLPanel::childSetCommitCallback(), onClickBack(), onClickCancel(), onClickNext(), onClickOK(), onCommitVoiceEnable(), and TRUE. Definition at line 63 of file llfloatervoicewizard.h. Referenced by createPanelDeviceSettings(), draw(), onClose(), and onOpen(). Definition at line 62 of file llfloatervoicewizard.h. Referenced by draw(), LLFloaterVoiceWizard(), and ~LLFloaterVoiceWizard().